Bradley Dortch did most of his damage today before 9 a.m.
Bradley Dortch has a good memory. Honestly, though, how could he forget what happened a year ago today? Dortch was the leader going into the final day of the Santee Cooper Southeastern FLW Series, but eventually settled for 4th after Bryan Thrift swooped in with a 30-pound stringer to collect the victory. 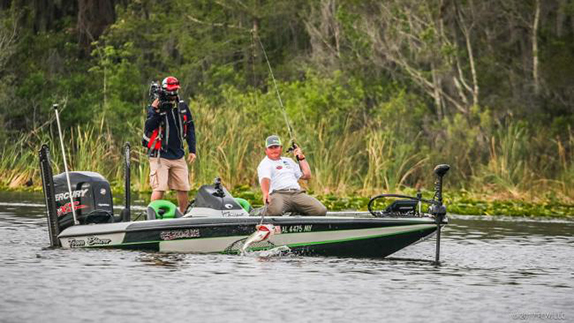 Fast forward to today, when Dortch found himself in 5th heading out for the final day of the Harris Chain FLW Tour ��the third event of his rookie season on Tour. Thrift was in 4th, just 6 ounces ahead of him. In Dortch�s mind, all he cared about was beating Thrift. Winning wasn�t on his radar. 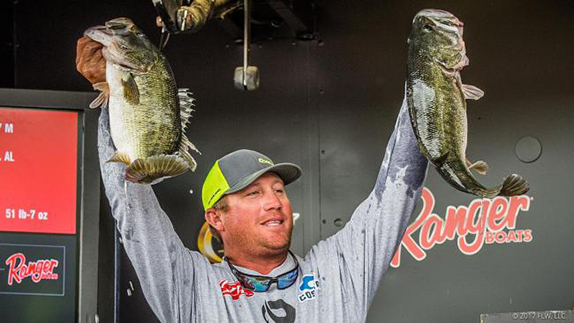 Neither was catching 22-02 and rallying from 3 1/2 pounds back to beat Florida stalwarts JT Kenney and three-day leader John Cox, not to mention that Thrift guy, to capture the victory. The 37-year-old industrial electrician from Atmore, Ala., finished with 73-09, which bested Kenney by 1 pound, 12 ounces, halting Kenney�s dazzling day-4 rally that included a tournament-best 27-03 stringer that gave him 71-13 and moved him up seven spots from 9th. 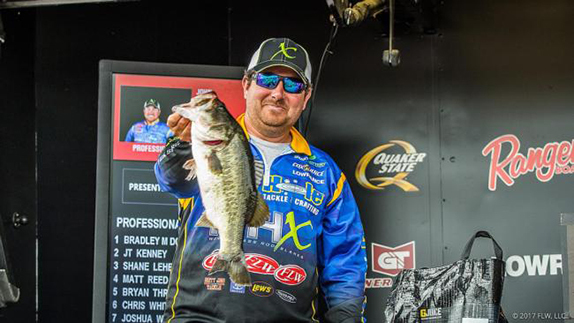 Cox, who relied on his home-lake history at the Harris Chain and stuck with sight-fishing virtually all week, managed 14-03 and slipped to 3rd with 69-01. Shane Lehew, who�d been in 2nd the first three days, caught 13-05 competing on Sunday for the first time in his career and took 4th with 66-01. 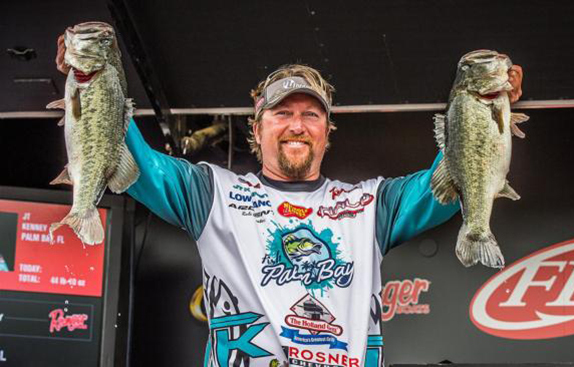 Matt Reed, the ex-Elite Series veteran who made the move to the FLW Tour in 2017, capped off his best tournament in several years with a 5th-place finish behind a 12-06 stringer that pushed his total to 64-14. 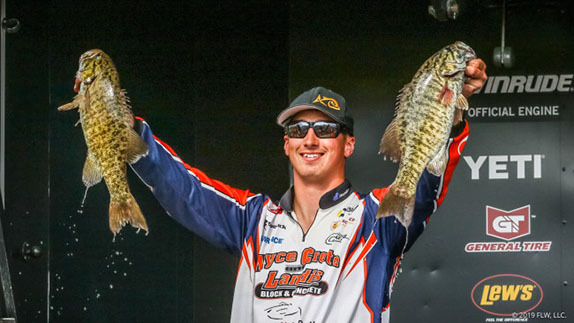 Thrift retreated two spots to 6th and now has three top-6 results in the first three derbies as he has taken a commanding lead in the Angler of the Year points standings with four tournaments remaining. Once again, big fish made all the difference today as Dortch connected on two in the 6-plus pound class while Kenney had 4 of that caliber. The finalists spanned out across the chain with no one lake really dominating the week. There were enough sight-fishing opportunities this week to keep anglers just interested enough, but there was also an ample supply of post-spawn fish that ultimately turned the event in Dortch�s favor. In the end, Dortch�s stretch of pads and separate area with isolated hydrilla in Lake Harris proved to hold the winning fish, but the health of the entire fishery was on full display this week amid ideal spring conditions. The FLW Tour is idle until April 6-9 when it visits Lake Cumberland in Kentucky for the fourth stop of the season. Poor execution plagued Dortch earlier in the tournament, but on Sunday he caught the fish that mattered most. Dortch hadn�t executed as well as he�d have liked the first three days so he figured he was due for a reversal of fortune today. When he arrived at the clump of grass Sunday morning where he�d lost two big fish Saturday, it didn�t take long for his luck to change. Within a few casts of working the worm through the same grass, he caught another 6-pounder. From there, he fished more relaxed and felt like his plan was finally coming together. 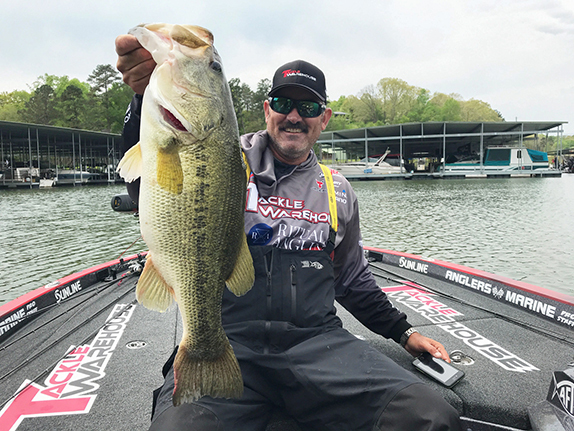 He finished his limit with two more solid keepers and culled with a 3-pounder around 3 p.m.
Dortch�s better bites came out of a 150-yard stretch of pads with 6 to 7 feet of water on the edge, the deepest pads he�d found all week. The other key element was an isolated clump of hydrilla that he estimated produced nearly 30 pounds of his weight this week in Lake Harris. Additional details about Dortch�s patterns and the rest of the top 5 will be published later this week. Don�t expect Kenney to shed a tear about falling short of what would�ve been an epic 9th-to-1st comeback. JT Kenney nearly erased a 10-pound, 4-ounce deficit today, but was still happy with 2nd place. He made an instinctual decision today to change things up and abandon his flipping and pitching routine in Lake Harris. Instead, he targeted shell beds in Lake Griffin, where he�d caught a 4-pounder in practice doing the same thing. �I figured, �What the heck? Let�s go do that,� he joked. He said after catching just 10-00 on day 3, he figured the bass hanging around the cattails, pads and arrowheads were starting to get depleted. Plus, with cloudy and breezy weather in Sunday�s forecast, he figured a moving bait would be more productive. He alternated between a Strike King Red Eye Shad and Booyah Hard Knocker to draw strikes from post-spawners feasting on the bait that was also on the shell bed. He doesn�t think he�d change anything in terms of how he fished all week. Cox started the day casting instead of looking, but eventually spent the balance of his day searching for difference-makers that he could see. He found them, but couldn�t get them to cooperate. Regardless of what he tried, the fish weren�t in the mood to bother with his bait. At one point, he returned to an area he�d fished previously only to find locals who�d been watching the FLW Live feed fishing the same area. �They said they didn�t know I was coming back and told me they�d caught two 3s and a 4,� Cox said. As far as regrets, he has none. He loves to sight-fish and he was in his comfort zone being close to home. 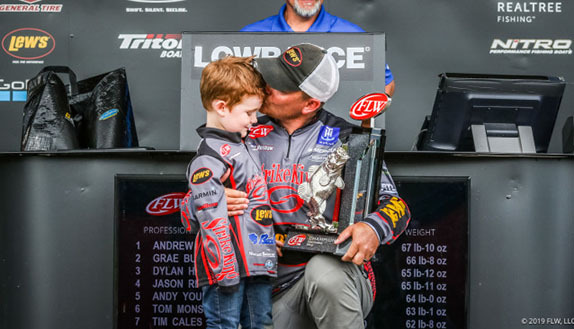 Catching bass was a breeze for Lehew all week, but as the tournament wore on the big ones in the area he focused on in Little Lake Harris either grew wise to his ways or became less numerous. Either way, he was pleased with recording his best career finish as a pro. He had a one-two punch of casting a lipless crankbait through and around a large hydrilla flat not far from an expanse of scattered lily pads with 2 to 4 feet of water under them. John Cox felt like he was around the winning fish on beds, but couldn't them to cooperate when he needed them to. Reed stuck with his simple Carolina rig strategy today in Lake Eustis, but he sensed the population of fish inhabiting the shell beds he kept visiting was starting to dwindle. Still, he was thrilled to collect his best finish in a tour-level event since he placed 4th at the Clarks Hills Elite Series back in May 2010. �I think they got tired of me and it didn�t replenish last night and the cupboard just went dry,� he added. �Personally, things are in a much better place now,� he said. �My mind is in a much better place. At (Lake) Travis two weeks ago, I didn�t get paid and finished a pound out of the money. But practice at Travis felt right. Things fell into place. Everything was going good and even after Travis, I felt like I was getting the tires back on the road. > After three events, the Angler of the Year race is starting to take shape with Bryan Thrift way out front with 593 points (out of a possible 600). Brandon Cobb is 2nd with 552, followed by Clark Wendlandt (538), Mark Rose (536) and Casey Scanlon (518).